Can the optical-equipment provider beat its guidance yet again? Consumer demand for 4K video and cloud computing is driving up the demand for bandwidth around the world, which is putting a strain on networks everywhere. That trend is forcing internet service providers to invest aggressively in their networks to keep up with demand, which is greatly benefiting optical-equipment makers such as Infinera (NASDAQ:INFN). The company is getting ready to report results from its second quarter, after the market closes on July 27. Let's look at what investors can expect to see when the company reports, along with a list of three key areas that I plan on watching closely. Infinera's shares plunged 24% the day after the company reported results from its first quarter, signaling that the markets were disappointed. That wasn't because the company reported a bad quarter -- revenue jumped 31% and earnings per share rose 19% -- but rather because it forecast that growth this quarter was going to be challenging. In absolute terms, 23% revenue growth sounds great, but it's far below the 31% growth the company recorded in the first quarter. Wall Street usually doesn't look kindly upon the prospect of decelerating growth, which is why many bailed on the stock. So is growth really slowing down, or is management just guiding conservatively to maintain its streak of exceeding expectations? Did the big Transmode customer return? If demand for optical equipment is still so strong, why is the company's growth rate expected to slow at all? On its last call with investors, management stated that a "significant" customer of its Transmode division hadn't purchased any products from the company in the past six months. Infinera believes that its relationship with this key customer is still healthy, but having a big spender sitting on the sidelines is proving to be a difficult hurdle to overcome. So did the customer return, or is it gone for good? Management might not be willing to divulge that much detail during its conference call, but since this customer appears to be critical to growing its top line quickly, investors will want to keep their ears open. Many technology companies that focus on business to business sales often have a hard time maintaining their profitability That's because customers often command huge bargaining power and can demand favorable prices, which is something many companies comply with to grow or maintain their market share.That trick can do wonders to juice short-term results, but it often causes the company's margins to contract over the long term. Last quarter, we saw this trend line continue to march higher. 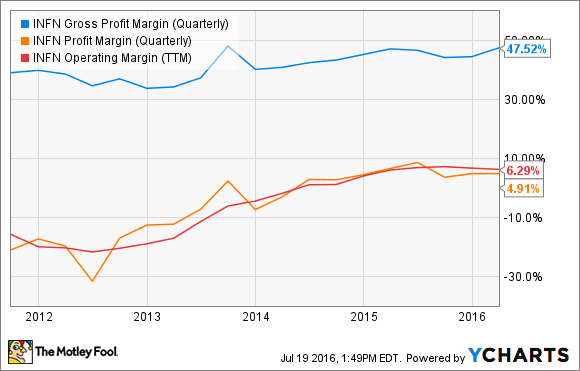 Non-GAAP gross margin hit 50.2% for the quarter, up substantially from the year-ago period. That figure even exceeded the company's long-term target range of 50% for the first time. Infinera non-GAAP operating margin also grew slightly and came in at 12.3% for the period, which is getting awfully close to its long-term target of 15%. The company isn't expecting to make much progress on this front during the second quarter. Management is projecting that its gross margins will land right around 48% this quarter, with operating margins also declining to about 11%. The lower results are being driven mainly by loss of leverage from the slower-than-hoped-for revenue growth, which in turn appears to be the reason earnings are expected to be consistent with the year-ago period. Did the company sacrifice profitability to continue to gain volume, or did it remain disciplined? Investors should have their answers to all of these questions in just a few short days.